When we were planning our Spiti route, we searched for off-beat locations in the Kinnaur region and came across articles about Sangla. On researching further, I heard about a tiny village, Chhitkul (as its locally spelled), located about 20 km from Sangla. This is supposed to the last accessible village this side before the Indo Tibet border. There wasn’t much information online but I did find a newly opened hotel in Chitkul, called The Wanderer’s Nest who agreed to host us for 3 days. Chitkul was our stop after Narkanda and before we headed to the Spiti region but we didn’t know much about it apart from what our friends had told us. The road trip took us through the NH which soon turned into a single lane highway where the roads cut through mountains with deep gorges on one side and sharp hanging rocks on the other. Soon the snow-capped mountains were in our sight as we slowly maneuvered through the hilly terrain. Around lunchtime, we took a right from the highway towards Sangla-Chhitkul route. Here, we were welcomed by roads that seemed to disappear into the mountains. Dirt roads, with small waterfalls and streams flowing through it along with a view of the Sangla valley. This 40 km took us over 2 hours to cover as the roads were very narrow, terrain rough. Even the slightest mistake would send us tumbling thousands of feet below into the Baspa river. Even worse was when buses from the opposite end came charging towards us and we had to literally stick to the rocky walls to avoid being hit. There wasn’t enough space for 2 vehicles to cross easily and driving on such roads is a tough task! It was 3 pm and we were desperately searching for a restaurant when we came across a Bengali joint in Kuppa. We were intrigued and decided to see what a Bengali restaurant was doing in such a place. The locals told us that most restaurants in the region employed cooks from Bengal, Bhutan, and Nepal. Our quick-lunch consisted of rice, daal and aaloo bhaja and we rushed towards our pit stop for the next 3 days. It would get dark soon and we didn’t want to drive in these roads at night. The roads kept getting worse but the landscape grew even more beautiful with each turn we took. At Mastrang, we were stopped by ITBP for verification. We took the opportunity to offer them some mathi and nimki our mom had packed for us and spoke to them about their life in the Himalayas. So close, can literally touch them! Make sure you don’t cross this stretch on a full stomach! Although the inclines are not much, the roads are dangerous due to sharp rocks protruding on one side and deep gorges on the other. We slowly covered the stretch from Sangla to Chitkul in about an hour’s time. 5 pm – We finally reached our stay, The Wanderer’s Nest. The view is absolutely mind-blowing as the hotel is located in a valley surrounded by snow-capped mountains on all four sides. We soak in the sights for a few minutes and head to the hotel. A short 2-minute hike to our room leaves us gasping for breath. The facility is just 2 months old and the owners welcome us with a hot cup of chai. Chirag and Manoj are partners and decided to set up base here when they visited Chitkul a year ago. The weather is cold and soon after checking in, we curl up in our cozy bed for a short nap. The alarm buzzes and we realize we slept through the evening. It’s 6 am, we rush out to get a glimpse of the sunrise from our balcony. The view is mesmerizing as we witness the sun peeking out from behind the Himalayas and hiding in the clouds. A cool breeze blows, courtesy the Baspa river located next to our hotel, bringing with it the aroma of aaloo paranthas that are being served in the area downstairs. Here we get introduced to Neha and Ramneek, who have traveled from Delhi. We quickly take a liking to them as they love traveling too and have recently completed a ride to Nepal. Over breakfast, we discuss our trips and decide to hike towards the Baspa river. Soon after gearing up, we walk through the village, consisting of not more than 40 houses, down towards the river. There is snow along the shoreline as Archana makes a run for it! From eating snow to snowball fights, we had a lovely time playing around the river for a while. Hungry from our escapades, we head to the market which has only 3 shops. This ain’t a Maggi commercial though!! Luckily, we find one that served Maggi and bread omelet. Ahh, the joy of finding such simple food in the middle of nowhere is inexplicable! After 2 rounds of snacks, we decide to go for a short drive towards the ITBP check post and have hot Momos there. As we were devouring the onion-filled momos, we see the weather turn bad as the wind speed picks up drastically and black clouds march in from behind the mountains. The sun disappears behind the clouds, the landscape turns a bit gloomy! We are advised to rush into the room as a snowstorm was on its way towards Chitkul. A slight drizzle hits us on the way as we quickly yet carefully drive through the valley towards our hotel. By the time we head back, the downpour has started! The drops get heavier and in no time we see snowflakes against a mountain. “It’s snowing! !”, screams Archana as she rushes towards the open area to catch the snowflakes. The breeze gets cooler and stronger. The temperature drops and our jackets, gloves, and warmers seem to be doing a bad job of keeping us warm. Not able to withstand the cold, we run into our rooms. We switch on the heater and hide inside the tons of blankets we carried from home as well. A couple of hours later, we see fresh snowfall on the mountain peaks but not enough towards the valley. Harsh, who assists the owners light up a big bonfire and we are served hot paneer and rotis. The food at The Wanderer’s Nest is the highlight and we were very happy with the Nepali cook they have employed. Everything in the menu was prepared without much oil or masala and just the food we like when we travel! To fight the cold, we somehow manage to convince one of the staff members to procure locally prepared alcohol for us. Along with Neha and Ramneek, we cuddle up in our room, play Uno and down shots of the sour tasting concoction. The drinking and cards melee goes on till 1 am. Exhausted, we decide to call it a night as the Delhi based couple were leaving in the morning. Day 3 here starts with hot pooris and aaloo sabzi served with pickle and tea. Over breakfast, we decide to explore the village and attend a morning session at the Chitkul Govt high school. As we start walking towards the village, we notice the sound of drums and strange chants coming from the direction we heading to. A closer peek reveals a puja being carried out in one of the 6 temples in the village, today the locals are praying in the Bhootnath temple. The air is filled with aromas of incense sticks. The valley echoing with drums as we see locals carrying a colorfully decorated palki towards the temple. We are advised against using our phones and told to observe from a distance. An old man chanting mantras, takes out a huge dagger, cuts his finger and starts throwing blood into the temple. He seems to be in a trance as he then carries a huge sword, pointed into his gut, inside the temple. We are soon escorted out of the place since the locals like their ceremonies to be a private affair. Initially, we were a little shook up since we are not used to seeing such traditions being carried out back in the city. But then we realize that it was a great cultural experience for us as we learned something new about the people in Himachal. A trip to the local school was a journey back in time where from a distance, we observed the morning rituals of the school assembly. The singing of the national anthem, reading of news, and a short yoga session as well. It had been so many years since we had seen this as the city schools seem to have dropped these activities. We had always heard of something called a white-out and never really knew what it was; till today. I was woken up from my mid-day slumber to heavy snowfall in the valley. Looking outside I could see huge snowflakes that looked like cotton balls appearing from above the mountains and covering in the valley in no time. I was experiencing such snowfall for the first time. We didn’t know how to react and couldn’t decide if I should just run outside and enjoy it or take videos and pictures. Over the next 1 hour, I saw the village covered in a layer of snow. And the landscape changed from green to white! Nature wasn’t the only one painting the town white, as we also caught up with members of Delhi Street Art. They were here to create art in the hotel as well as the village landscape. Oodles of talent were displayed as we saw the youngsters draw graffiti in the rooms and common areas of the hotel. Apart from massive murals, the team also showcased their musical skills as we huddled around the bonfire for a guitar session. But it was soon interrupted by locals who came with a very peculiar request. We were asked to go inside our rooms, switch off all the lights and stay indoors for the next half hour. Though we were very curious to know what was happening, all of us obliged and stepped indoors. After half an hour, we were asked to switch on the lights and we quietly walked outside our rooms. The locals told us that the villagers were carrying out religious prayers to ward off evil spirits. In the half hour, they burst crackers, walked to a local graveyard and buried 2 dolls made of wheat. Not very sure what the rituals were but we found it very intriguing! The next day we invited a few locals over for breakfast and learned about their eating habits as well. Apparently, in one tradition, they rub salt over freshly cut meat and store it under their houses for years altogether. Chhitkul being a cold place, has very less vegetation and during winters people literally, go into hibernation. The meat is then used in winters to survive and stored for as long as they want. We were told that during special occasions people pride themselves in having meat that is sometimes 4-5 years old! In another story, we learned that in ancient times Lord Shiva is said to have crossed through Chhitkul. The evil spirits who were part of his entourage decided to stay back here and make it their home. And that’s why there is a Bhootnath temple here and we got to witness the bhootnath puja a day earlier! A view to kill for! 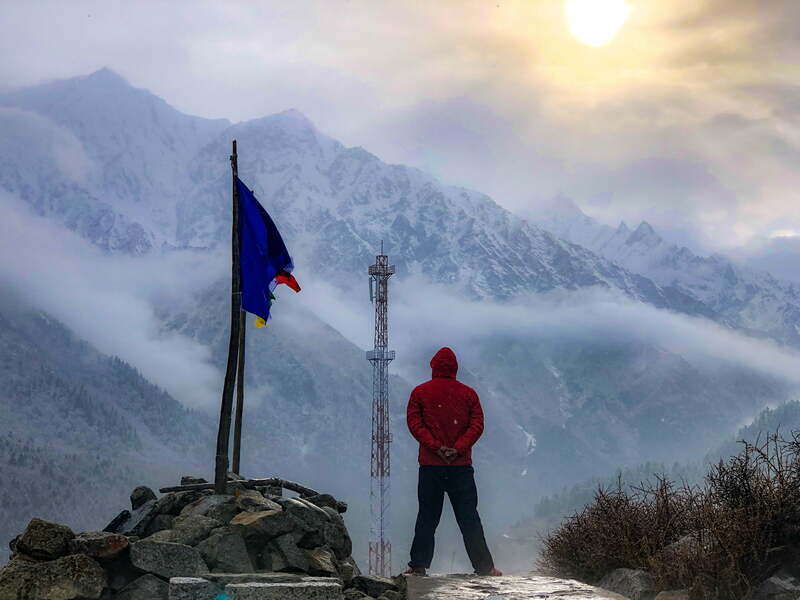 A visit to Chitkul has left us wanting for more as so much is yet to be experienced in this valley of dreams. We loved the serenity of the place, the hospitality at The Wanderer’s Nest and the personal touch provided by the hosts! We got to experience the winter bliss, snowfall here but would love to come during the summers to see a greener landscape. The best time to visit Chitkul would definitely be from May onwards as the summer brings the valley to life. Everything turns green with the river buzzing with life, carrying fresh water directly from the melted Himalayan snow! And it you are looking for a hotel in chitkul, then do check out The Wanderer’s Nest. If you are heading to Kinnaur region, you should also make a stopover in Narkanda, which is a famous skiing destination in Himachal.